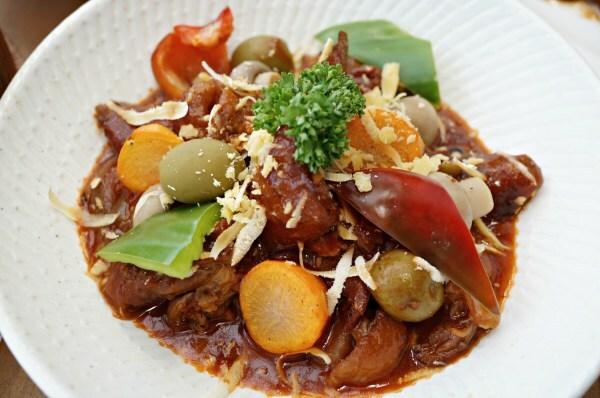 The classic Filipino stew of goat and vegetables in rich tomato sauce thickened with liver spread. A hearty meal that your family will surely love. 1 tbsp olive oil to drizzle. 1. In a deep pan, sauté oil, garlic, onion, liver spread, and goat meat. Pour in red wine, season with salt and pepper. Add tomato paste, tomato sauce, bay leaf, and beef stock. Let it simmer until the goat meat is tender. 2. Add cayenne pepper, paprika, and thyme. 3. Fry potatoes and carrots in a separate pan. 4. Add bell peppers and green olives. Drain the potatoes and carrots and add them. 5. Let it simmer until potatoes and carrots are cooked. 6. Drizzle with olive oil and stir then serve.